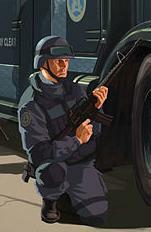 A NOOSE agent wielding an M16 in a GTA IV game art. 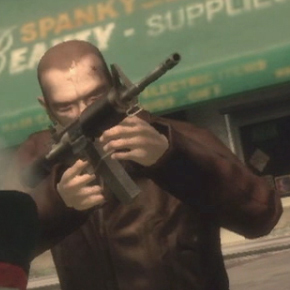 Niko Bellic wielding an M16 in GTA IV. An M16A2 in the intro cutscene for GTA Vice City. The Armalite/Colt M16 series of assault rifles are a staple of the GTA series, first appearing in GTA III, and then in every GTA game since. The M16 is useful in almost any situation, boasting accuracy, power and magazine capacity. Since the rifle fires the relatively powerful 5.56mm NATO round, it has noticeable recoil, albeit not nearly as much as the bigger AK-47. Throughout the games, the models of M16 derivatives features differ slightly, along with zoom capability, rate of fire, and power. In Grand Theft Auto III, the firearm is an 'exaggerated' Armalite AR10, with an extremely high rate of fire and a 60-round magazine. In GTA Vice City, the weapon is rendered more realistically — it resembles a Colt Model 733, although it is referred to incorrectly as the "M4". Grand Theft Auto: San Andreas and Liberty City Stories share the same 733. In Grand Theft Auto: Vice City Stories, an M16A1 is used instead, recognized with the full plain stock and longer barrel. GTA Vice City Stories (1984): An M16A1, named "Assault Rifle" in-game. It is correct in the model type as the M16A1, since the M16A2 entered service first with the United States Marine Corps in 1986, two years after GTA Vice City Stories takes place. However, it is not totally chronologically accurate as 30-round magazines were introduced in the mid 70's, and its rate of fire is true to real-life M16s but the magazines are out of date. Lance Vance humorously mentions the M4 during a mission, which is an anachronism. GTA Vice City (1986): Modeled after a Colt Model 733, incorrectly titled "M4" within the game (the M4 was not introduced until 1994). Originally, an M16A2 was meant to be in the game but it was later replaced by the 733. Its model can still be found in the game's files and it can be seen in some cutscenes (more notably - one of the deal ambushers during the intro cutscene is wielding one). On the other hand, the gun more closely resembles the CAR-15 which would be more accurate within the time period. GTA San Andreas (1992): Reused Colt Model 733, again titled "M4" in-game. 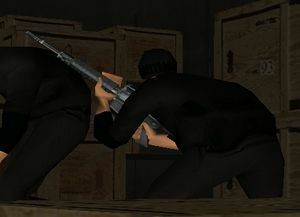 This version has an unrealistic reload animation wherein Carl Johnson charges the weapon with his left hand — real M733s are charged with a rear-mounted handle. In this case it's possible that CJ is pressing the bolt release, but the pulling motion of his hand negates this. This rendition has a 50-round magazine, not possible with real-life M733s, although they can use various STANAG magazines. In the mission Stowaway, a government agent is shown holding a camouflaged Colt M16A1; this, however, is never available to use in-game. GTA Liberty City Stories (1998): Reused Colt Model 733, once again titled "M4" in-game, which is chronologically accurate. Has a realistic rate of fire, unlike its GTA III counterpart, but, like the GTA San Andreas rendition, the reload animation is inaccurate. GTA III (2001): Resembling the similar Armalite AR10, it is referred to as an M16. This version is a highly inaccurate and exaggerated weapon, with a 60-round magazine, an exceptionally high rate of fire, and an extremely high 52 points of damage, making this weapon extremely deadly against anything, ranging from vehicles to enemies or even Claude himself. It is also missing the delta ring and is very boxy due to its low poly-count. GTA IV (2008): An M4A1, titled "Carbine Rifle" in-game. This version is accurate both in timeline and overall features, although it sports a rear drum sight and lacks a carry handle, giving it some resemblance to the similarly-designed Heckler and Koch HK416. It is the longest-ranged non-sniper weapon in the game. It has "Property of Liberty City Arms" stamped where the magazine release is normally found, probably a reference to the "Property of U.S. Govt" stamped on its real-life counterpart. The bottom of the magazine is also stamped with the words "Stop Chillin Start Killin". GTA Chinatown Wars (2009): Referred to as the "Carbine Rifle" in-game, it is difficult to identify this gun, however it has a full stock and long barrel, suggesting an M16 (model unclear, possibly A2). It has tremendous power, more akin to that of a machine gun, and it has a 50 round magazine like its GTA San Andreas incarnation. GTA V (2013): A custom AR-15 carbine, also titled "Carbine Rifle" in-game, with a Vltor upper receiver, Northtech Billet lower receiver with ergonomic pistol grip, an ACE Skeleton stock (incorrectly shown as collapsible), a handguard similar to the Daniel Defense MFR 9.0, and a 10.5" barrel tipped with an AAC Blackout flash hider. Similar to GTA IV's M4A1, it lacks the carrying handle, making use of a rear drum sight. Unlike the M4A1, however, it lacks a fixed front sight base, instead having a rail-mounted Troy folding battlesight on the end of the handguard. Weapon mods include an extended magazine (increasing ammunition capacity to 60 rounds), an angled foregrip (Magpul AFG2) that gives added stability and a slight increase in accuracy, a flashlight, a scope (ELCAN SpecterDR), a suppressor that silences the weapon but slightly reduces its damage and range, and various color tints. GTA Vice City, GTA San Andreas, and GTA Liberty City Stories. Unused M16 icon found in the data for the mobile versions of GTA Vice City. This is essentially a blue-and-pink-colored version of the M16's HUD icon in GTA III. GTA Liberty City Stories/GTA Vice City Stories. The Armalite AR-10 featured in GTA III. The Colt Model 733 used in GTA Vice City, GTA San Andreas, and GTA Liberty City Stories. The M16A1 seen GTA Vice City Stories. The M4A1 which is seen in the GTA IV era. The Colt M16A2 seen in GTA Chinatown Wars. A similar AR-15 carbine to the one seen in GTA V, minus the specific receiver components and rear sight. Rockford, Staunton Island - Available to buy from Phil Cassidy's Army Surplus for $5,000 after completion of "Arms Shortage." Bedford Point, Staunton Island - In the walled off area in the southeast part of Liberty Tree offices (use the nearby Moonbeam, park it by the lowest part of the wall, climb the Moonbeam, and jump over the wall to access). Cedar Grove, Shoreside Vale - On the back porch of the pink house (fourth from the west) at The Homes. Cochrane Dam, Shoreside Vale - Near the top of the stairs for the west dam platform (not the top of the Cochrane Dam power house) at the base of the Cochrane Dam. Delivered to Safehouses after collecting 90 Hidden Packages. Prawn Island - In Studio B (behind the moon lander) at the InterGlobal Films complex. If the player has not completed Phnom Penh '86 or purchased the film studio yet, the only way to access this M4 is by means of a Unique Stunt Jump into the film studio by a fast vehicle (a PCJ-600 is recommended as it can jump out of the film studio as well). Little Haiti - In the center of a cluster of shacks in north Haitian neighborhood (just south of Auntie Poulet's house behind the house with the Voodoo parked in front). Starfish Island - In the small room at the bottom of the Mansion's stairwell east of the main entrance after the completion of Rub Out. Downtown - Available to buy from Ammu-Nation for $5,000 after completion of Rub Out. Los Santos International Airport, Los Santos - Next to the runway, there are three white and yellow striped "ramps". The gun is between those which are placed at the end of the runway. Palisades, San Fierro - Behind a house next to the beach. Area 69, Bone County - Behind a staircase leading to a control tower. Note that a 5-star wanted level is attained upon entry of this area. Pilgrim, Las Venturas - On the roof of the hotel. The Four Dragons Casino, Las Venturas - In front of the casino when all 50 Horseshoes are collected. Newport, Staunton Island - Among the containers at the docks and east of an unique stunt jump. It's located between the containers that are placed towards the Big Shot Casino. Bedford Point, Staunton Island - Available to purchase from Phil Cassidy's Fully Cocked Gun Shop for $5,400 once the player beats the mission Friggin' the Riggin'. Vice Point - Behind the building next to northernmost empire site. Vice Point Mall, Vice Point - Available to buy from Ammu-Nation for $5,400 but the price is decreased to $4,050 when the player beats Phil's Shooting Range. The M4A1 in Grand Theft Auto IV is referenced in-game as the Carbine Rifle. It can be purchased from the back-alley gun shops for $5,000 and each additional magazine will cost $100. It can be purchased from Little Jacob for $3,500 and each additional magazine costs $70. The Carbine Rifle can also be acquired from NOOSE officers and certain LCPD officers. It cannot be fired from cars, unfortunately. This weapon can kill with two headshots in multiplayer and single player, and is highly effective during Team Deathmatch. The M4A1 is the best weapon to have with its unique and perfect combination of capacity (with 30 round magazine, enough for 15 kills per magazine with perfect aim), power (2 headshots kill anybody without armor), range (most range on a non-sniper weapon in the game), and accuracy (resets to point aimed at almost immediately). This weapon can turn an early deficit into a comeback and even a blowout against stronger, better armed, or teams with more people, and is even more effective on single player and against police and pedestrians on multiplayer, where it is usually a 1-hit kill. Bohan Industrial - Can be found in one of the offices inside the abandoned warehouse where the player rescues Roman from the mission Hostile Negotiation. Algonquin Bridge - Can be found atop the roof of the pedestrian walkway on the Algonquin side, from the monorail station entrance. Easton - Can be found well-hidden behind some trash cans on the east side of Grand Easton Terminal. The trash cans can be reached quickly through an alley on Jade St.
Leftwood - Can be found underneath the pier where the strip mall is situated off Beaverhead Ave. The strip mall can be seen from the cliff where Niko executes Aiden O'Malley during the mission Tunnel of Death. Tudor - Can be found in a small loading dock area on the north side of the old Sprunk factory. Tudor - Can be found atop the northern superstructure of the old rail bridge that spans the river which divides Tudor and the Acter Industrial Park. A blue-and-pink version of the M16's GTA III weapon icon can be found in the HUD data files on the iOS and Android versions of GTA Vice City, internally named "hud_m16". This page was last modified on 29 June 2015, at 07:12.